MES observed Martyr’s day today, January 17 in the memory of those who laid their lives on this day in 1956 during the protests against the inclusion of Belagavi and other cities in Mysore state then. In the police firing that happened 5 MES activists of Belagavi, One from Nippani and one from Khanapur were killed. Since then each day on January 17, homage is paid to the martyr’s at Hutatma Chowk and Kirloskar road where the firing happened. 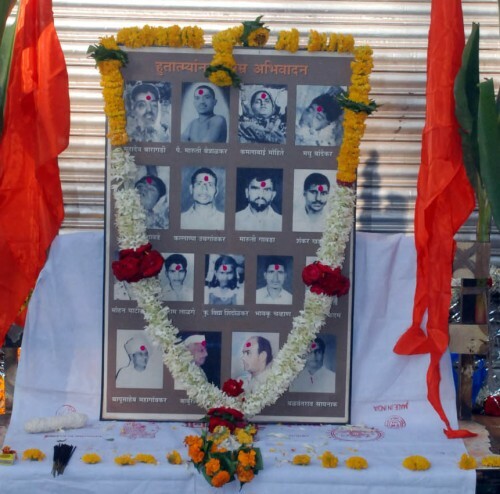 The activists put floral garlands on the portraits’ of the martyrs and observed two minutes silence at the Chowk. Business establishments adjoining to the Chowk area were closed down for some time.